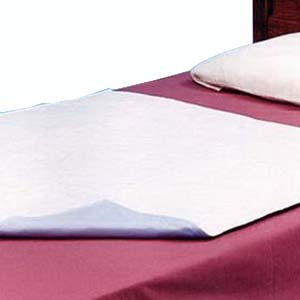 Quick-Sorb Reusable Underpad, 34" x 35"
Essential Medical Quick-Sorb™ Reusable Underpad has a quilted top sheet with waterproof back with an extra soft facing to reduce the possibility of skin irritation. Features soft, cotton surface for cool comfort and an absorbent soaker layer for complete bedding protection. It is large enough to completely cover a hospital-size bed. Brushed polyester quilted top sheet. Quilted top sheets with waterproof back. Heavyweight 8Oz liquidfill absorbent center. Machine washable/dryable up to 300 times. Patterson Disposable Underpads 36" x 23"